This elegant Forever Classic halo ring showcases a 6.0mm round brilliant cut moissanite center gemstone with 28 accent gemstones creating the halo and accented band. Beautifully crafted in rhodium plated sterling silver and secured in a four prong setting. Ring size 6. The primary gemstone has a Diamond Equivalent Weight (DEW) of 0.80ct (Actual Weight 0.68ct). The total Diamond Equivalent Weight (DEW) is 1.08cttw (Actual Weight 0.90cttw). 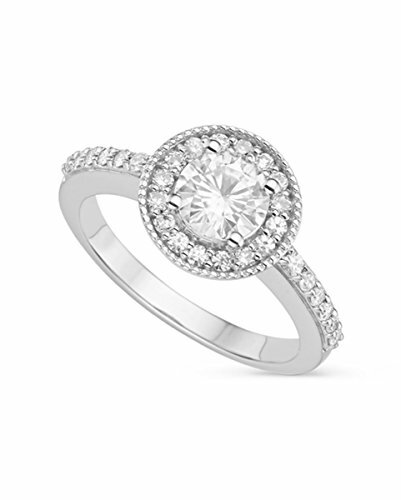 The moissanite and accent stones have a total Diamond Equivalent Weight (DEW) of 1.08cttw (Actual weight 0.90cttw).